China and the United Nations – In Connecticut! 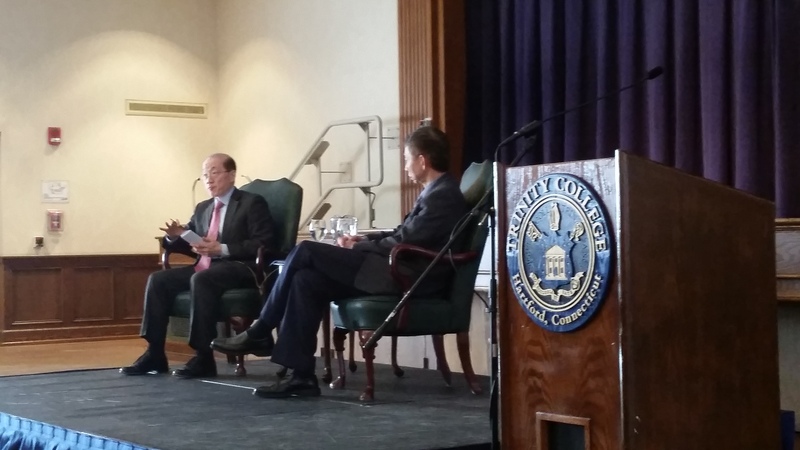 On April 1, 2015, Trinity College’s Patricia C. and Charles H. McGill III ’63 International Studies Fund hosted His Excellency Liu Jieyi, Chinese Ambassador to the UN. 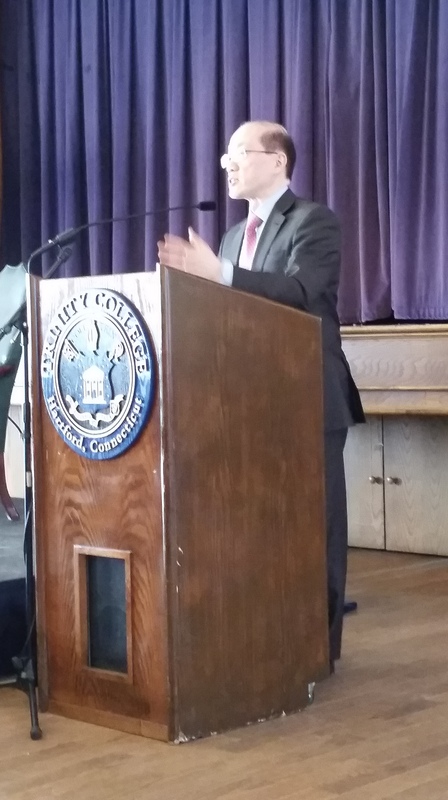 The lecture was co-sponsored by the World Affairs Council of Connecticut and United Technologies Corporation. This year marks the 70th anniversary of the end of the Second World War and the creation of the United Nations, which the Ambassador took as an opportunity to reflect on the UN’s past and its future development. The Ambassador highlighted four major trends impacting the development of the United Nations since its founding 70 years ago. Decolonization throughout the 1960s and 1970s expanded the number of member states dramatically. The end of the Cold War changed the nature of security threats and ended the nuclear arms race, ended the mutually-assured destruction theory and added new members from the former U.S.S.R. Multipolarization has additionally changed international dynamics; the European Union is a significant player, and many developing countries are gaining influence. Finally, he asserted, globalization has played a role in creating new opportunities, new challenges, and new international interactions. The world is increasingly interdependent and no country’s interests or concerns are isolated. His Excellency called for greater cooperation with the intent of advancing common interests, calling “win-win cooperation” the new international relations paradigm. The UN, he said, is the most important platform for addressing the problems we face today – no other organization is as representative of the world as a whole. The UN is only as efficient and capable as its members, and more and more members are recognizing the potential the UN has as a mechanism for addressing global issues. China, he asserted, wants to see the UN strengthened and has played a large part in contributing to UN efforts and wants to see the world of international relations become more democratic. He highlighted the two major themes for future UN action as peace and development. Regarding the former, he said we needed to look back to the history of the UN and world conflict to learn historical lessons. Regarding the latter, he highlighted the four key elements of the post 2015 Development Agenda as being: joint determination for sustainable development; setting and meeting specific targets; determining the means of implementing programs, and developing a review process. The Ambassador also stated that China is dedicated to cooperative collaboration internationally and regionally. Speaking specifically on relations in the Asia-Pacific, he cited four key cooperative strategies: fostering mutual respect and equality as well as diversity and participation in decision-making; working together, rather than dominating efforts, towards common development; developing common, comprehensive security measures; and fostering harmony of different cultures and civilizations. The lecture was followed by a brief question and answer session. The Ambassador spoke on the potential for re-structuring and expanding the UN Security Council, emphasizing the need for patient, democratic negotiations to ensure the result is viable, inclusive and sustainable. In discussing Syria, he prioritized stopping violence and bringing all actors to the table for negotiations rather than condemning or alienating particular actors like Assad. He also touched on the territorial disputes over the Spratly Islands with China, as well as China’s support for the G77, efforts towards transpacific trade and growth, and plans for developing a regional bank to provide financial assistance for sustainable development. Ultimately, he argued, China will work with others towards sustainable, mutual growth.